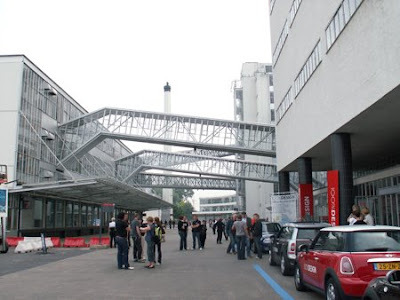 This weekend I went to 100% Design in the Van Nelle factory in Rotterdam to check out what's happening with interior design plus bit of networking. The building of the Van Nelle factory it self is one architectural art piece. Some features are well known like the uneven bridges from one building to the other. Not everything is my taste of design however there were some very innovative designs there and not just contemporary design of furnitures. However for an interior design event they had allot of cars in and around the building. 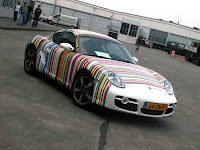 First there was a Porsche Cayman parked outsite with a quite cool colorsheme which was place there because for Cayman for Kids. 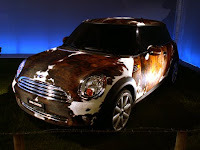 Second is the cowskin covered Mini Cooper next to a cowskinned chair, however it looks quite artistic I bet it's a hell of a job to clean. 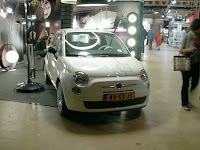 Third is a Fiat 500 not sure why it there but still it's quite an amazing design for a car. 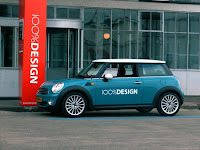 Last is the 100% Mini Cooper of the people who are working at 100%Design to take you to the offsite locations. 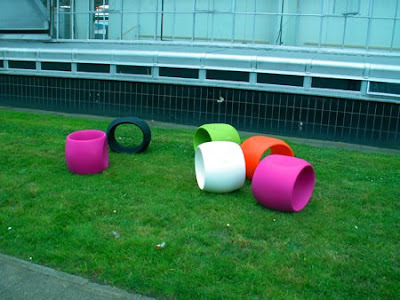 The first actual design you see when you walk on to the Van Nelle factory ground are these big rings which are called Zero where you could sit on to rest. And yeah it's quite a long walk from the entrance of this place to the actual entrance of the building. The second thing was this unusual box. Actually I am not really sure what it should had been displaying in on those screens because I didn't found any on-button and all the screens were blacked out. The first cool furniture I saw was this odd chair in a swirl like shape. It look quite unusual but very interesting. And that was it for now the rest of the picture of this event will be posted very soon so don't miss it, because I also met the girl who was posted big in the newspaper for this event.